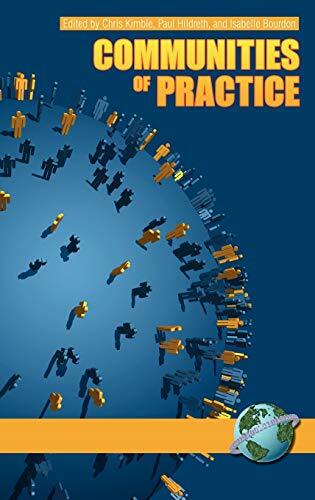 The aim of this set of books is to combine the best of current academic research into the use of Communities of Practice in education with "hands on" practitioner experience in order to provide teachers and academics with a convenient source of guidance and an incentive to work with and develop in their own Communities of Practice. This set of books is divided into two volumes: volume 1 deals principally with the issues found in colocated Communities of Practice, while volume 2 deal principally with distributed Communities of Practice"
Chris Kimble is a lecturer in Information Systems in the Department of Computer Science at the University of York. Before moving to York, he was lecturer at the University of Newcastle's Business School, and a researcher for the Business School and Department of Computer Science at the University of Northumbria. His broad area of research is Knowledge Management. His areas of particular interest are Communities of Practice and the problems associated with supporting distributed working in a cross-cultural or trans-national context. He is the leader of Management and Information Systems Research group at York and a co-founder of the Northern Interest Group on Information Systems and Organisations (NISG). He has supervised a number of PhD students and has published over 40 articles in journals, conferences, reports and books. He is the academic contact for Knowledge Management for the WUN (Worldwide Universities Network) at the University of York and is a member of the editorial board of the journal Information Research.